Fury's Fire by Lisa Papademetriou. The Sequel to Siren's Storm. Review: Have you read Fury's Fire yet? If you haven't read an engaging book lately, this is the book for you. Fury's Fire is written by Lisa Papademetriou, and it is a sequel to Siren's Storm. 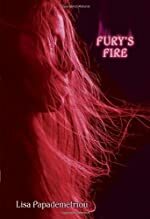 Fury's Fire is book number 2 in the Sirens series. Gretchen and Will, great friends, have just begun their senior year of high school in Walfang. Gretchen doesn't remember the events of ÒSiren's Storm,Ó but Will does. Gretchen had saved their lives, but now she doesn't understand what is going on. She is trying to focus on fitting in at her new school. She also keeps having weird dreams. The only people who can help her are Kirk, a boy who had a nervous breakdown, and Mafer, a girl who is thought to be a witch. What will happen next? In my opinion, Fury's Fire is more suitable for teens than adolescents because there were a couple of inappropriate words in the book. What I liked about Fury's Fire is that it had a lot of suspense, which made me want to read more. Also, there is a twist in the story that you will not see coming. What I didn't enjoy is that the plot was kind of confusing to me. Also, I think that you would have to read Siren's Storm to understand Fury's Fire since it is a sequel. I recommend Fury's Fire to teens because it has an interesting plot. Once start reading the book, you can't stop! We would like to thank Random House for providing a copy of Fury's Fire for this review. Have you read Fury's Fire? How would you rate it?